You might wonder if sailors would be too superstitious to serve on a ship named HMS Terror, but when it was commissioned as a bomb ship, the name probably sounded reassuring. During the War of 1812, the Terror helped lay siege to Fort McHenry, thereby contributing to the composition of “The Star-Spangled Banner.” However, when it was retrofitted as a polar exploration vessel, it stopped instilling terror and started attracting it, according to the laws of karma. It will be the crew’s profound misfortune to be assigned to an impossible mission, under the command of a tragically hubristic commander in the new period horror limited series The Terror, produced by Ridley Scott, which premieres on AMC this Monday—and the first three episodes will also screen together during the upcoming What the Fest!? Sir John is determined not to return until he finally discovers the long-sought Northwest Passage, but unfortunately, it does not exist. Frankly, Captain Francis Crozier probably suspects as much. He is second in command to Franklin (who leads the expedition from HMS Erebus), and directly skippers the HMS Terror. Franklin is convinced providence will eventually open up a back channel to China for them, but you could say hope does not cut much ice that far north. 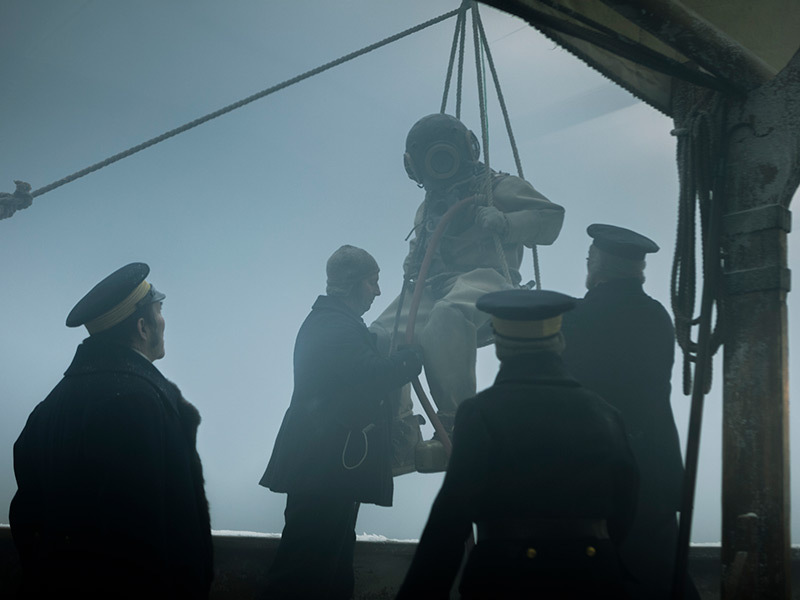 Based on Dan Simmons’ novel, The Terror combines the icy dread of Lovecraftian horror with the grim but fact-based realities of conditions during a Nineteenth Century polar expedition. There is a palpable sense of claustrophobia, isolation, and biting wind-chill throughout the series. The set and design craftsmanship is absolutely first-rate, but from time to time, the battery of directors (Tim Mielants, Edward Berger, and Sergio Mimica-Gezzan) allow too much slack in the line. Arguably, this ten-episode series could have easily run a leaner, meaner eight episodes without seriously ill-effects. Nevertheless, it is impressive how skillfully co-showrunners David Kajganich and Soo Hugh build this sinister ice-bound world and establish the intricate network of relationships among the expedition’s crew. It is also nice to see a major television production entrusted to veteran character actors like Jared Harris and Ciarán Hinds. Indeed, both are well within their elements, bringing complex, humanizing dimensions in the dour, whiskey-medicating Captain Crozier and the arrogant, tunnel-visioned Franklin, who both feel a strong emotional attachment to their crews, but which manifests in very different ways. 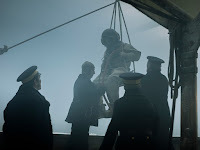 Harris and Hinds give the series instant credibility, but Tobias Menzies delivers what might be the best performance, involving the most extreme character development arc, as James Fitzjames, the expedition’s third in command. Initially, he comes across like a Mr. Darcy-like character, but he becomes considerably humbler as reality sets in and his sympathies swing from Franklin’s gung-ho position to the pragmatism of Crozier. For obvious reasons, this is a very Y-chromosome cast, but Nive Nielsen is terrific as the mysterious Lady Silence. Adam Nagaitis chews the scenery like an old pro, making a suitably despicable villain as the mutinous Cornelius Hickey (typically pronounced “Higgy”). Likewise, Paul Ready is indelibly memorably as the tragically empathetic Harry Goodsir, the ship’s surgeon (ranking below the doctor in 1800’s terminology). It definitely feels like a long voyage, but there are scenes in Terror that will really stick with viewers. The term “punished as a boy” will always ring with meaning and a third act death clearly evokes David’s painting of The Death of Marat in its grim elegance. This is an effectively moody slow-boiler, but when the creature attacks, the effects are quite good. The series should also keep viewers honest with respect to the over-hyped storms that recently dusted through the City. Sure, there was a little snow, but there was no need to worry about scurvy. 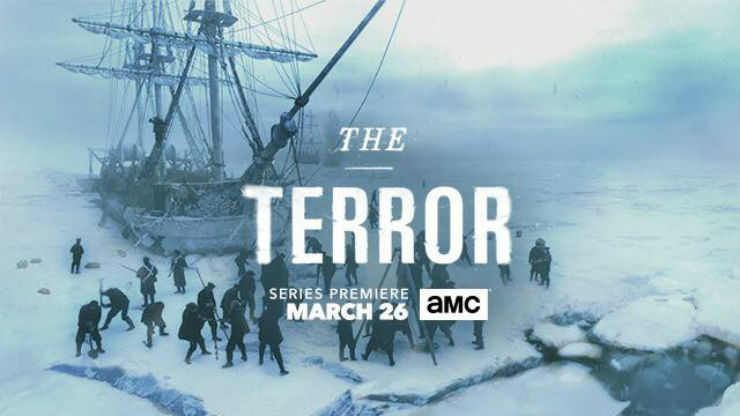 Recommended for fans of atmospheric period horror, somewhat in the Hammer tradition, The Terror premieres this Monday (3/26) on AMC—and 30% of it screens during What the Fest! ?, at the IFC Center.